A hugely popular figure with the Castle Park fans for the way he plays on the field and the way he conducts himself off it, Challinor has been one of the mainstays of the Doncaster pack in recent years since arrving from Rotherham Titans. Despite being in the twilight of his career, Challinor’s legendary durability has helped him see off the challenges of younger teammates and he recently signed another one-year contract. “Obviously I’m delighted to have been offered a new deal,” said Challinor, who celebrated his 35th birthday last month. 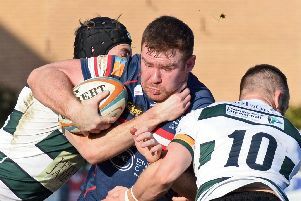 He certainly played his part in an impressive display by the Doncaster pack in the win over fourth-placed Bedford at Castle Park last time out. “I thought the forwards played well against Bedford and we needed to,” he said. “We’d done a lot of soul searching over our form in recent weeks and we were all bitterly disappointed with the result at Jersey. “We couldn’t wait to put it right and we feel as though we did against Bedford and it was good for the team’s morale to beat a good side like them. “We didn’t have a game last weekend and while the break has been useful for those players carrying knocks I would have liked to have played. “It’s easy to start feeling sorry for yourselves when you are on a bad run but once you pick up a win then you can’t wait to get out there again. “It won't get any easier at London Irish on Saturday,” he added.